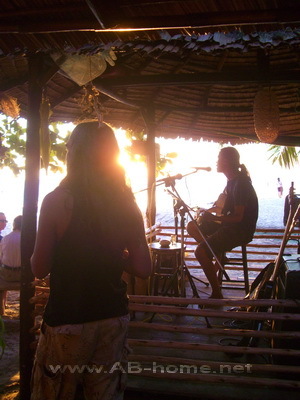 The Tapas Bar is a great location direct at the beach of Had Sai Khao on the tropical island Ko Chang in Thailand. The beach bar on White Sand Beach offer everythink what you exept from a Restaurant on the sea: Cocktails, Beers, Reggae music, friendly staff and a beautiful sunset in the evening. Here at Tapas Bar you have the choice between meet good people from around the world, sit and chill or just read a book under trees with the ocean sound in the back. Sometimes a good Blues Band play fantastic live music here on this tropical bar at white sands on Koh Chang. The cosy bamboo hut serve aswell delicious food. My favourites are the baguettes and the french fries. The Tapas Beach Bar is open till late in night. Try it, this bar is one of Koh Chang’s to adresses on White Sand Beach. Tapas Bar on Koh Chang: A great bar with great staff on a perfect location next to the gulf of Thailand. What is the name of the bungalowes resort just behind Tapas bar?